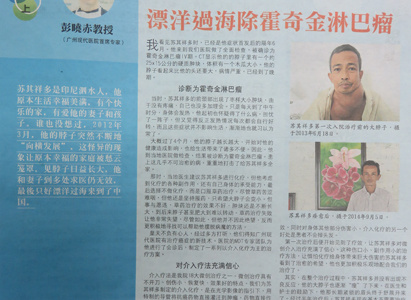 On November 25th, 2015, Malaysian Guang Ming Daily published an article about the anticancer story of DEDI IRWAN SUGIANTO. Since taking herbal medicine is useless, he decided to take treatment in Modern Cancer Hospital Guangzhou. After taking comprehensive treatments here, his tumor on the neck disappeared, and he restore to health now. In the early of 2012, a lump appeared on his neck, since there was no pain, DEDI IRWAN SUGIANTO did not pay attention to. Although he suffered from fever every afternoon, he just worried for a short time because he found that the fever would disappear soon. He even got used to the fever. About four months later, the lump on his neck became much bigger. He realized the severity and went to the local hospital for examinations. Unfortunately, he was diagnosed with Hodgkin lymphoma. Doctor suggested him to take chemotherapy, but he refused because he worried about the side effects brought by chemotherapy. He decided to take herbal medicine to control his condition. However, it did not help. The lump continued to enlarge; he even could not turn his neck due to the big lump. Although herbal treatment did not work, DEDI IRWAN SUGIANTO never gave up; he positively looked for better treatment to help him get rid of the tumor. After researching, he got to know that Modern Cancer Hospital Guangzhou has advanced minimally invasive therapy, so he decided to take cancer treatment in China. In July, 2015, DEDI IRWAN SUGIANTO came to Modern Cancer Hospital Guangzhou. After a joint consultation of the Multidisciplinary Team (MDT) of Modern Cancer Hospital Guangzhou, a therapeutic plan based on interventional therapy was specially made for him. His condition stated to turn better after the first session of interventional therapy; he gradually gained confidence form minimally invasive therapies. DEDI IRWAN SUGIANTO suffered from no side effects during the whole treatment, his big lump narrowed. After half year’s treatment, his tumor disappeared and there is no need to take treatments anymore. Now, he looks like a normal people and live a normal life.